Millwall striker Jermaine Easter has signed a new one-year deal with the Championship club. The 32-year-old, who moved to The Den last summer, scored three goals in 20 league appearances this season. Meanwhile, the Lions are in talks with keeper David Forde and winger Lee Martin about new contracts. Defenders Shane Lowry and Jack Smith, midfielder Liam Feeney and striker Andy Keogh have all been released by manager Ian Holloway. 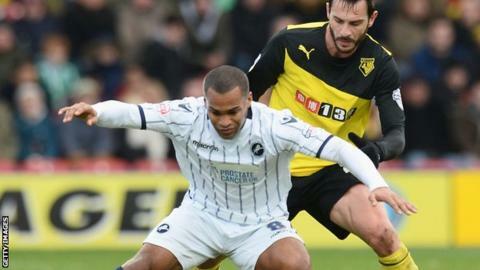 Former Aston Villa man Lowry, 24, who joined Millwall in January 2012, made 82 appearances during his spell in south London, 23 of them this season, scoring twice. Smith joined from Swindon in 2009 and played a total of 123 games for the club, but the 30-year-old was restricted to just nine outings this season. Feeney and Keogh, both 27, spent most of the campaign out on loan, Feeney with Bolton and Blackburn and Keogh with Blackpool. Feeney scored seven goals in 83 games for Millwall after joining from Bournemouth in 2011 while Republic of Ireland international Keogh found the net 18 times in 78 appearances after arriving from Wolves in January 2012.